A dynamo meter is a device to measure force, moment of force (torque), or power. Almost dynamometers perform the same essential function, measuring the torque, rotational speed and power output of a combustion engine, electric motor or other power source. Although in modern day, dynamo meter has integrated with computer, software and pick up easily such as portable dynamometer but development of dynamometer has been developing through many decades. From the invention of Dynamometer by Gaspard de Prony at 1828 which has name de prony Brake, Charles Babbage in 1838 who introduces car dynamometer, William Froude who invents first hydraulic dynamometer, John Taylor who form Taylor Dynamometer, and Martin & Anthony Winther who introduce first eddy current dynamometer, these dynamometer development is almost spent more than one hundred years. For a first time user, Dynamometers will seem complicated but once you understand the basics, it will know how to use it. A dynamometer is basically a measuring tool, in the same way as voltmeters, ampere meters, scales, speedometers, etc. There is several type of dynamometer such as Engine dynamometer, chassis dynamometer , etc. Let’s we see Engine dynamometer, this dyno is specifically can make the most important engine diagnostic tool such as horsepower, torque and leaks. For Engine dynamometer there are several products line for this dyno such as water brake engine dynamometers, portable dynamometers, eddy current dynamometers, and AC dynamometers. 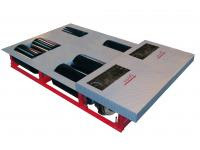 For chassis dynamometer, Tylor Dynamometers has manufactured chassis dynamometer since 1963. Chassis dynamometer has great function to identify low horsepower, overheating, emissions compliance and speedometer accuracy. Chassis dynamometer is also has several product line such as water brake dynamometer, eddy current style chassis dyno and AC dynamometer. If you want to search more product for dynamometer you can visit www.taylordyno.com, Taylor Dyno is dynamometer manufacturer since 1920. You can find great dynamometer products here.